The tremendous success of retail in India is inspiring players from other sectors to test the waters, hence bring along innovation to the sector. Imagine this---Retailing financial advice along with a cup of coffee! Sounds different and innovative? This is the latest format to create a buzz in the retail industry. Financial advising has taken a new turn, all together, by the introduction of ‘Wealth Cafe’ by Bajaj Capital, recently. Wealth café is a concept wherein walk-in investors can relax, have a cup of coffee while they discuss their financial goals and aspirations with expert financial advisors. The idea has been conceived only for shopping malls as the café is targeted at investors looking for financial advices and frequent the place quite often. The company launched its first Wealth Café in Noida in May 2010. 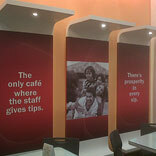 The cafe is a 900 sq ft outlet located in one of the most popular malls in the region, The Great India Palace. A prominent feature which helps in describing the interiors of the Wealth Café is the lounge, which makes the atmosphere very casual and friendly, and which would also be utilised for conducting various seminars on financial planning in future. There is a book shelf too, where the walk-in clients would find various interesting books on wealth creation. The format and style of other Wealth Cafes that the company plans to open in other leading cities of the country will also be on the same lines. “We are seeing a good response so far by opening up our first Wealth Café; we are confident that the concept will become popular very soon amongst the youth and the mass affluent population of the country. With this, we aim to create maximum number of ‘Crorepatis’ across the country and we are confident that we would be able to achieve our objective soon,” affirms Parashar. The target audience for the Wealth Café is the mass affluent population of the country who have high disposable incomes and who frequently visit shopping malls. “These are mostly individuals with savings in excess of Rs 25-50 thousand a month,” quips Parashar. The company plans to establish 25 wealth cafes in 6 cities (in shopping malls), in the next two years. “Our focus would mostly be on metros, since the mall culture is quite strong there,” reveals Parasher. The initiative promises to offer a complete experience as the café is designed to entertain the children too through interactive 7games, while their parents are engaged in discussion with the financial experts.